This hand-finished coffee table will bring a fusion of beauty and style to your outdoor furniture setting. Made up of using aluminum, wicker and fabric, this coffee table finishes a woven design over which rectangular shaped glass is topped, giving it an indigenous appearance that will help in creating an exceptionally elegant decoration. 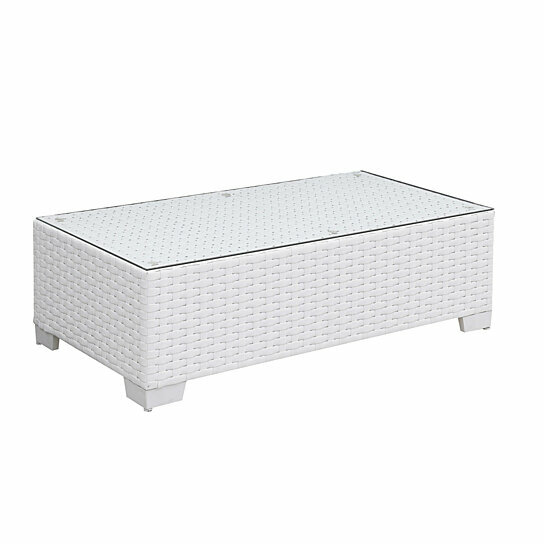 Featuring a lightweight design in a color of white, this coffee table features angled design feet and ideal for outdoor use. Use this coffee table with a same design and color tone sitting furniture to complete the outdoor setting.